My life as Zinovia Canale changed the minute I was diagnosed, with breast cancer. I knew if I had any chance of relocating the free spirit that lived in my soul from the clogged spirit of constant fear and anxiety that had taken its place, that I needed to do a lot of work. I had to change my eating habits, alter my alcohol intake, commit to an exercise program, and learn about mental fitness, all steps toward redeeming my previous thriving self. I began taking classes in cardio dance, which included hip hop moves that challenged my ability with balance, coordination and choreographic memory. I had danced ballet for many years during my adolescence, centuries ago. I have also danced the many different Greek dances including line and tsamikos all of my life. But learning cardio dance became more than just dance. It became a community among women of all ages and an opportunity to explore our beautiful sexuality with no judgment or barriers. From these classes, the Unity of Women Dance Project created by our inspirational teacher Jackie Henderson was born. For me, a newly official senior citizen, I found hope and power by collaborating with a large group of women on a creative project. This was a project that celebrated our gender, life producing individuals of varied shapes, sizes affiliations, who would work together to create a video that would and does project positive energy into the world. Rosie the Riveter served as our model from whom the moves evolved and from whom the “Rosie Shuffle” was created. More importantly as Rosie symbolized the power of women during a critical time in our American history, we a group of women from a small island in Rhode Island joined together to dance, perform, and create. 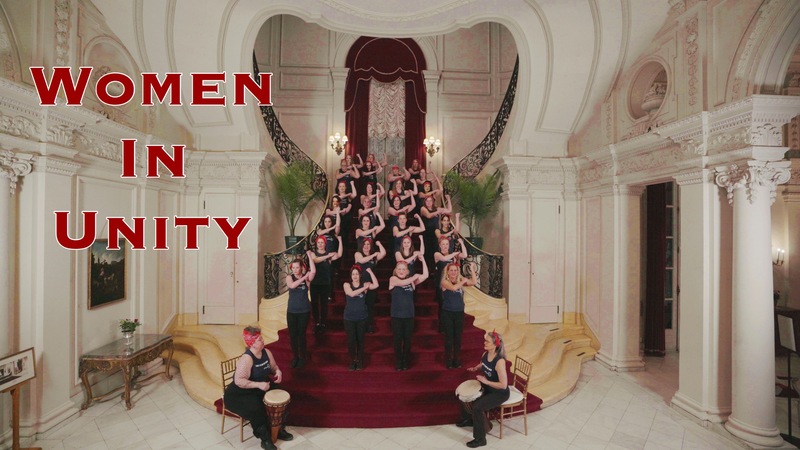 Using the backdrop of the exquisite Rosecliff Mansion in Newport, RI the video was filmed and we united, leaving all of our differences behind to enjoy ourselves. We conveyed a united presence encouraging all women to honor their individuality, their desires, and their voices among the many other attributes of living a full life. We attempted to drop our inhibitions and free our bodies and minds hoping to encourage other women young and old. Lots of conversations behind the scenes occurred as we each embraced our own journeys. And I for one, discovered the empowered Zinovia Canale, Breast Cancer Survivor.